I have to admit that it took us some time to get this falafel recipe right. A lot of the recipes we tried simply did not work....they were too claggy or lacking in the Arab flavours that are essential in this dish. 400g (dry weight) of canned chickpeas (garbanzos). One Small onion (very finely chopped). A handfull each of finely chopped Parsley and Coriander. 1 tsp. each of: cumin seeds, coriander seeds, and black peppercorns and 2 small chillis - all ground in a pestle and mortar. 4 tablespoons of flour and 1 teaspoon of Baking Powder. good quality olive oil for frying/or use a deep fat fryer if you prefer. OK - mash the chickpeas in glass bowl with a potato masher. Gently saute the onion in a little olive oil for 2-3 minutes and then add the garlic and gently cook until softened. Add to the bowl. Now add all the other ingredients and mix thoroughly. If the mixture seems too thick to you, add 1 or 2 tablespoons of water and mix again. Refrigerate the mixture for two hours - very important! Add your Falafel Balls - which you can shape in your hands - 4 at a time - turning once after about 3 minutes and then cooking for a further 3 minutes - until golden brown. No need to turn them if using a deepfat fryer. Drain on some kitchen paper and serve. They go specially well with our Tabouli Recipe Salad. Or with some sliced beef tomatoes with Vinaigrette. 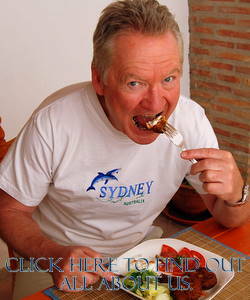 They also make great Tapas and are a tasty alternative for Vegetarians. Back to Tapas Recipes | Back to Vegetable Recipes. 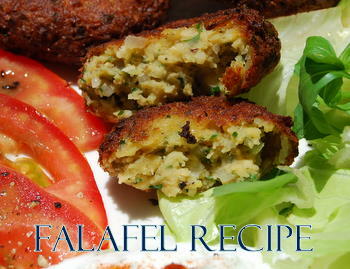 Click here to return from Falafel Recipe to the Homepage.